Retail Sales Lead takes charge of the sales team and supports the management in attaining its sales objectives. 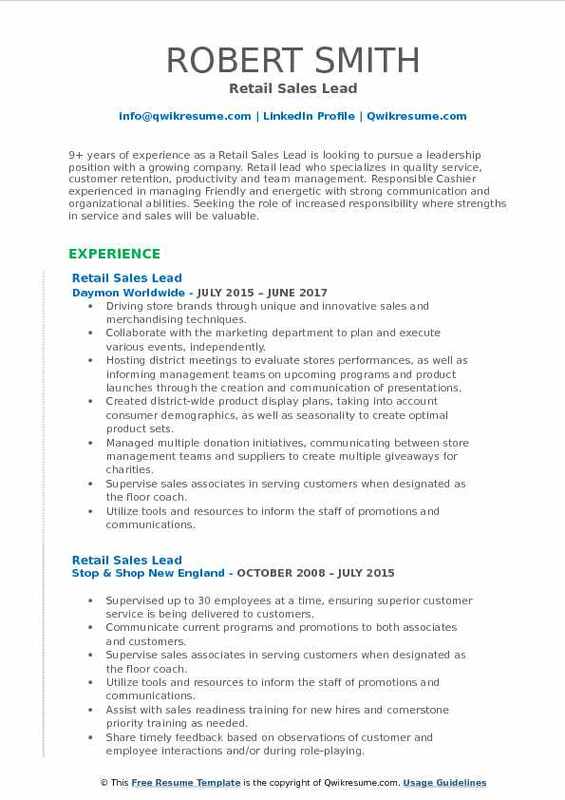 Some of the duties mentioned in the Retail Sales Lead Resume include hiring and training the sales staff, assigning or delegating tasks, solving customer issues, monitoring sales performance, reporting to senior management, executing floor leadership, assisting in inventory counts, checking merchandise displays, ensuring compliance with set standards, and executing all other tasks as assigned. Candidates aspiring to make a career in this line should demonstrate sales experience, leadership, strategic planning, time management, result orientation, strong communication, and problem-solving skills. Working knowledge of MS Office, time flexibility, and traveling capabilities are also needed for this role. Employers pick resumes that display a bachelor’s degree in marketing or sales. Previous sales success is a great plus. 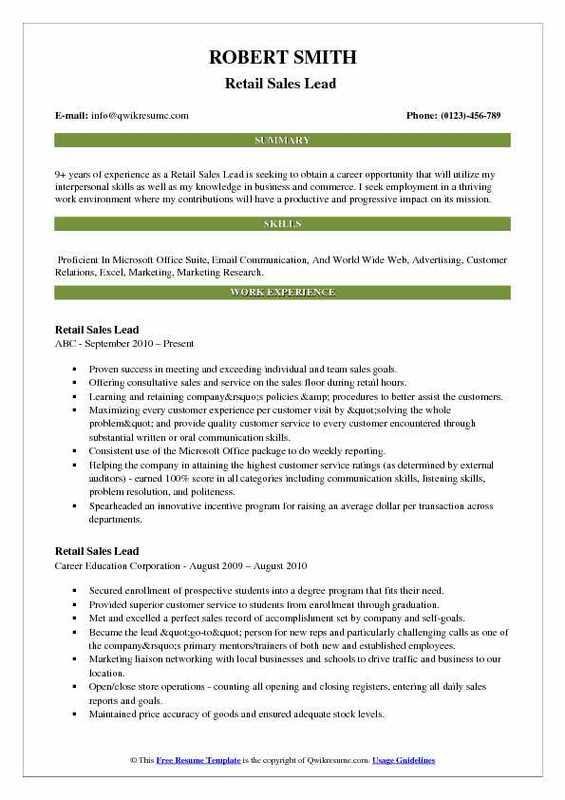 Objective : An accomplished and motivated sales professional with one year of experience as a Retail Sales Lead, seeking to obtain a position that will allow me to utilize my skills and experience to benefit an organization. Skills : Management, Project Management, Information System Expert, Point of Sales System, MS Office, Mac OS. Providing an exceptional customer experience by ensuring the customer is always the priority. Driving sales by consistently demonstrating exceptional selling skills and motivating team to ensure that individual, shop or store goals/priorities are being met and properly balanced. Assisting customers in all aspects of total store fulfillment and have the ability to satisfy the needs of our digital and physical customers by making appropriate partnerships when necessary. Empowering team to assist in all aspects of fulfillment to service customer needs and maintaining high customer readiness standards by delivering a clean, neat, easy to shop or store environment. Maintaining department recovery standards, including fitting room go backs to standard. Coach my colleagues to ensure consistent messaging of product attributes and our company culture. 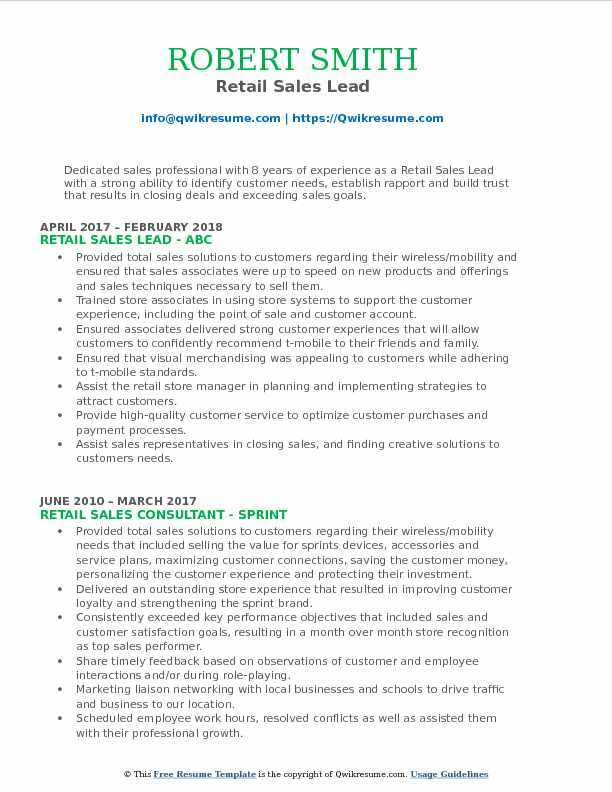 Summary : 11+ years of experience as a Retail Sales Lead is seeking a position in Sales Management or equivalent where I can utilize my experience, skill set, and dedication to increase sales and provide an amazing customer experience. Skills : Microsoft Office, Management, Account Management, Business Development, Customer Service, Inventory Management, CRM, Operations, Risk Management, Sales, Retail POS Tools. Training and coaching new employees according to new hire procedures and proven sales strategies. Frequently exceeding expectations with regards to sales goals, sales metrics, and customer satisfaction. Leading monthly employee performance evaluations and implementation of stretch goals. Leading weekly meetings on strategic imperatives, coaching peers on effective benefit positioning. Weekly customer commendations for exemplary customer service and honoring commitments. Years experience building/managing a large customer base including large enterprise accounts. Leveraging company advantages and make educated recommendations based upon needs. Daily market research to have a more tailored sales goal for each day. Managing a team of 10 to 15 retail associates in all aspects of daily store operations for the cultural institution. Opening and closing the retail location as well as maintaining merchandising and store cleanliness. 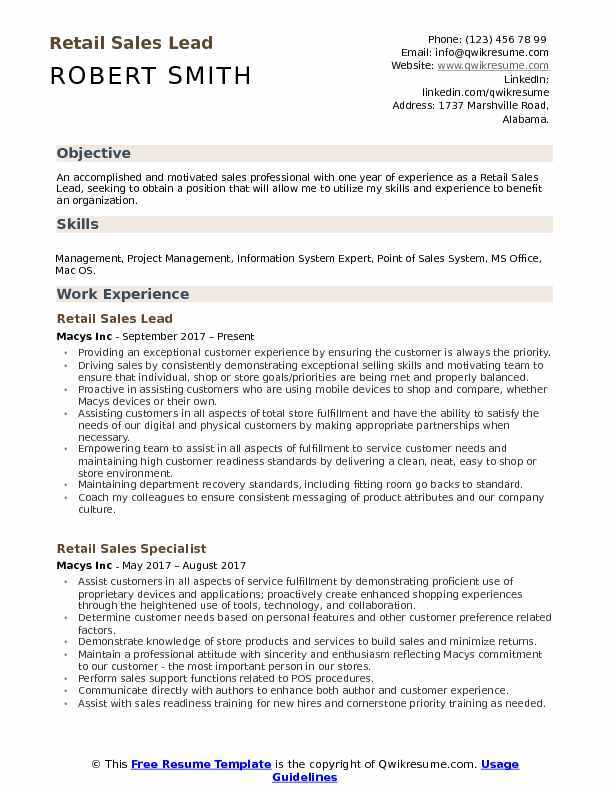 Summary : 9+ years of experience as a Retail Sales Lead is seeking to obtain a career opportunity that will utilize my interpersonal skills as well as my knowledge in business and commerce. I seek employment in a thriving work environment where my contributions will have a productive and progressive impact on its mission. Skills : Proficient In Microsoft Office Suite, Email Communication, And World Wide Web, Advertising, Customer Relations, Excel, Marketing, Marketing Research. Proven success in meeting and exceeding individual and team sales goals. Offering consultative sales and service on the sales floor during retail hours. Learning and retaining company’s policies & procedures to better assist the customers. Maximizing every customer experience per customer visit by "solving the whole problem" and provide quality customer service to every customer encountered through substantial written or oral communication skills. Consistent use of the Microsoft Office package to do weekly reporting. Helping the company in attaining the highest customer service ratings (as determined by external auditors) - earned 100% score in all categories including communication skills, listening skills, problem resolution, and politeness. Spearheaded an innovative incentive program for raising an average dollar per transaction across departments. Mentoring staff on hand-selling books and related merchandise through example and role-playing. 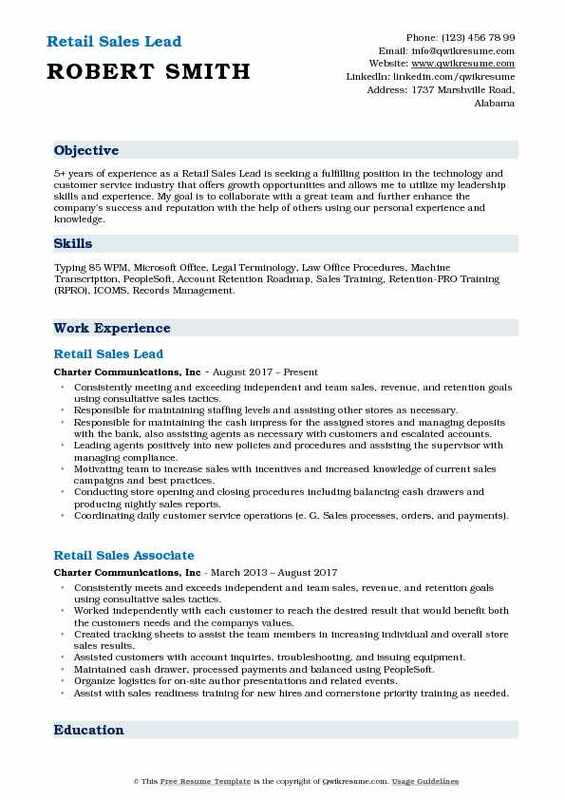 Summary : 9+ years of experience as a Retail Sales Lead is looking to pursue a leadership position with a growing company. 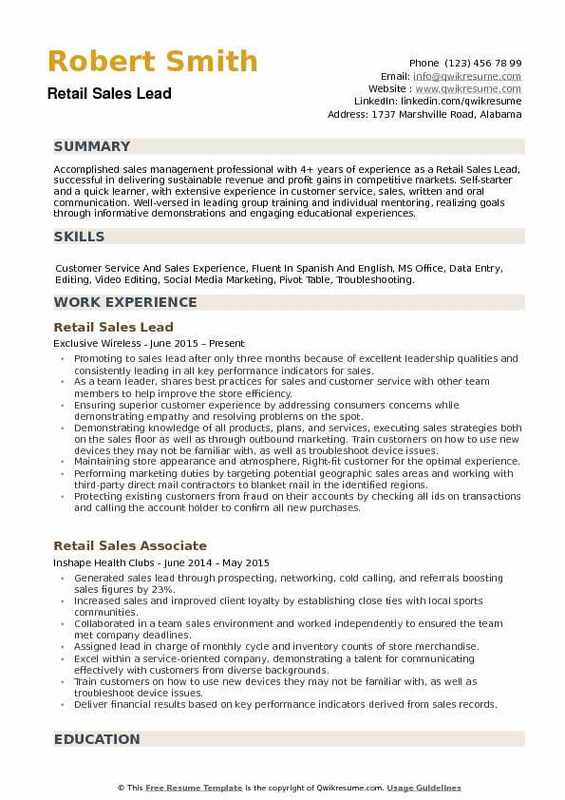 Retail lead who specializes in quality service, customer retention, productivity and team management. Responsible Cashier experienced in managing Friendly and energetic with strong communication and organizational abilities. Seeking the role of increased responsibility where strengths in service and sales will be valuable. Skills : Customer Relations, Excel, Marketing, Marketing Research, Key Social Media Advertising MS Office Including Excel, Powerpoint, Customer Relations, Service, Publisher Sales & Marketing Research / Analytics Leadership / Team Collaboration Creating and Interpreting Marketing Plans, Time Management, Organizational Promotions and Advertising, Public Speaking, Presentation, Design, Conducting SWOT and STP Analysis. Driving store brands through unique and innovative sales and merchandising techniques. Collaborate with the marketing department to plan and execute various events, independently. Hosting district meetings to evaluate stores performances, as well as informing management teams on upcoming programs and product launches through the creation and communication of presentations. Created district-wide product display plans, taking into account consumer demographics, as well as seasonality to create optimal product sets. Managed multiple donation initiatives, communicating between store management teams and suppliers to create multiple giveaways for charities. Supervise sales associates in serving customers when designated as the floor coach. Utilize tools and resources to inform the staff of promotions and communications. Researched neighborhood demographics to ensure campaign was directed at the target audience. Headline : A Professional with 6 years of experience as a Retail Sales Lead is looking to be employed in a position that will promote knowledge and allow me to gain skills and experience in a respected working environment. 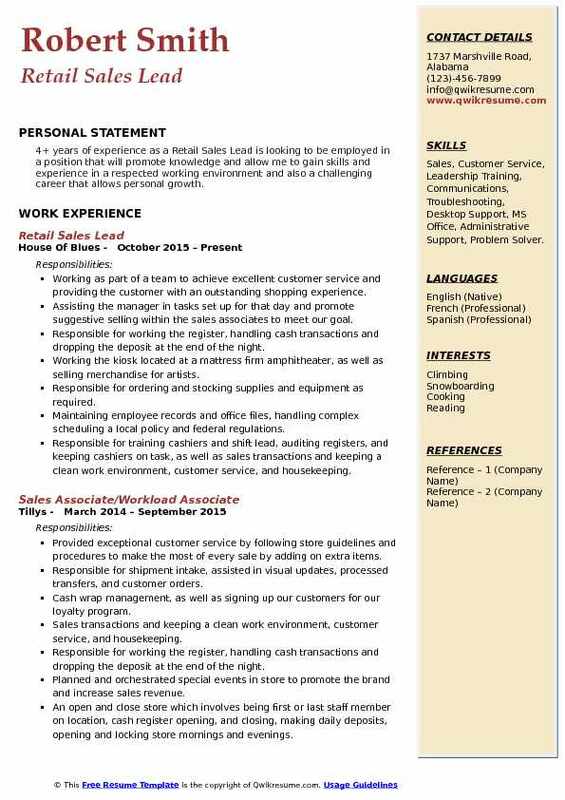 Skills : Customer Service, Retail Marketing, Retail Sales, Solutions, Troubleshooting, Desktop Support, Leadership. Responsible for delivering t-mobiles aspiration of being America's most highly regarded service company. Strategic thinking, relationship building influencing, talent management, results in focus and inspirational leadership. Build relationships with customers and understand their needs. Deliver a strong genuine customer experience that will allow the customer to confidently recommend t-mobile to their friends and family. Make wireless terms, products, and services seem simple and understandable. Ability to handle multiple priorities and customers. Know and use the store systems to support the customer experience, including the point of sale and customer account management, give support to co-workers when needed. Stay current on t-mobiles web-based resource and instructor-led training. Conduct regular audits to ensure the store is functional and presentable. Research emerging products and use information to update the store’s merchandise. 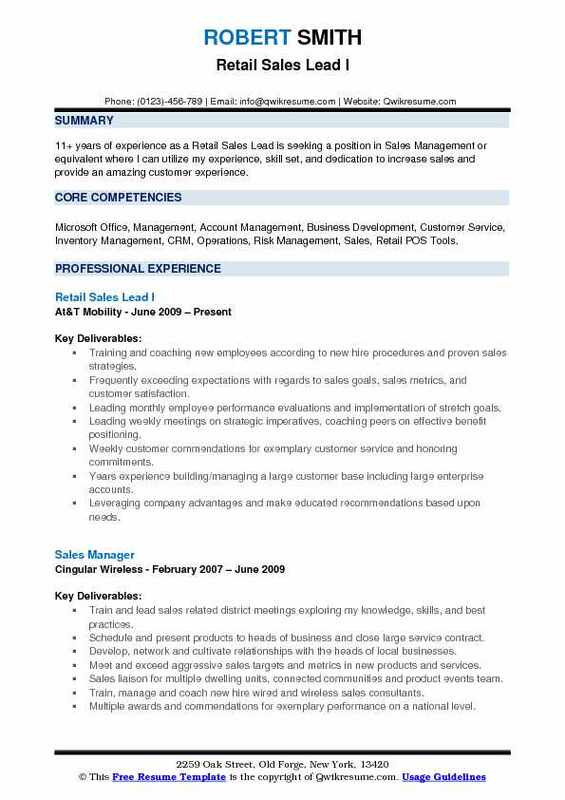 Objective : 5+ years of experience as a Retail Sales Lead is seeking a fulfilling position in the technology and customer service industry that offers growth opportunities and allows me to utilize my leadership skills and experience. My goal is to collaborate with a great team and further enhance the company's success and reputation with the help of others using our personal experience and knowledge. Skills : Typing 85 WPM, Microsoft Office, Legal Terminology, Law Office Procedures, Machine Transcription, PeopleSoft, Account Retention Roadmap, Sales Training, Retention-PRO Training (RPRO), ICOMS, Records Management. Consistently meeting and exceeding independent and team sales, revenue, and retention goals using consultative sales tactics. Responsible for maintaining staffing levels and assisting other stores as necessary. Responsible for maintaining the cash impress for the assigned stores and managing deposits with the bank, also assisting agents as necessary with customers and escalated accounts. Leading agents positively into new policies and procedures and assisting the supervisor with managing compliance. Motivating team to increase sales with incentives and increased knowledge of current sales campaigns and best practices. Conducting store opening and closing procedures including balancing cash drawers and producing nightly sales reports. Coordinating daily customer service operations (e. G. Sales processes, orders, and payments). Summary : Dedicated sales professional with 8 years of experience as a Retail Sales Lead with a strong ability to identify customer needs, establish rapport and build trust that results in closing deals and exceeding sales goals. Skills : Adobe Photoshop, Microsoft Office, Management, Leadership, Organization, Microsoft Excel, Data Entry, Retail Sales, Customer Service. Provided total sales solutions to customers regarding their wireless/mobility and ensured that sales associates were up to speed on new products and offerings and sales techniques necessary to sell them. Trained store associates in using store systems to support the customer experience, including the point of sale and customer account. Ensured associates delivered strong customer experiences that will allow customers to confidently recommend t-mobile to their friends and family. Ensured that visual merchandising was appealing to customers while adhering to t-mobile standards. 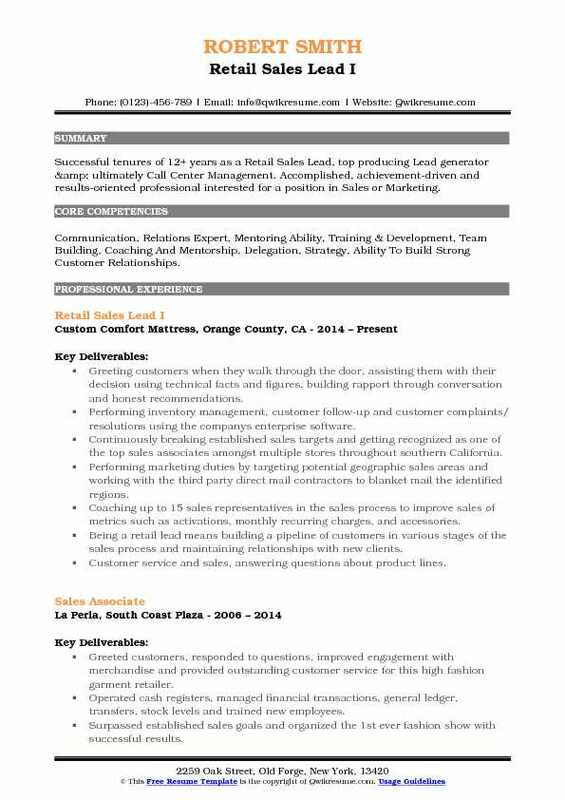 Assist the retail store manager in planning and implementing strategies to attract customers. Provide high-quality customer service to optimize customer purchases and payment processes. Assist sales representatives in closing sales, and finding creative solutions to customers needs. Summary : Successful tenures of 12+ years as a Retail Sales Lead, top producing Lead generator & ultimately Call Center Management. Accomplished, achievement-driven and results-oriented professional interested for a position in Sales or Marketing. Skills : Communication, Relations Expert, Mentoring Ability, Training & Development, Team Building, Coaching And Mentorship, Delegation, Strategy, Ability To Build Strong Customer Relationships. Greeting customers when they walk through the door, assisting them with their decision using technical facts and figures, building rapport through conversation and honest recommendations. Performing inventory management, customer follow-up and customer complaints/ resolutions using the company's enterprise software. Continuously breaking established sales targets and getting recognized as one of the top sales associates amongst multiple stores throughout southern California. Performing marketing duties by targeting potential geographic sales areas and working with the third party direct mail contractors to blanket mail the identified regions. Coaching up to 15 sales representatives in the sales process to improve sales of metrics such as activations, monthly recurring charges, and accessories. Being a retail lead means building a pipeline of customers in various stages of the sales process and maintaining relationships with new clients. Customer service and sales, answering questions about product lines. Objective : 4+ years of experience as a Retail Sales Lead is looking to be employed in a position that will promote knowledge and allow me to gain skills and experience in a respected working environment and also a challenging career that allows personal growth. Skills : Sales, Customer Service, Leadership Training, Communications, Troubleshooting, Desktop Support, MS Office, Administrative Support, Problem Solver. Working as part of a team to achieve excellent customer service and providing the customer with an outstanding shopping experience. Assisting the manager in tasks set up for that day and promote suggestive selling within the sales associates to meet our goal. Responsible for working the register, handling cash transactions and dropping the deposit at the end of the night. Working the kiosk located at a mattress firm amphitheater, as well as selling merchandise for artists. Responsible for ordering and stocking supplies and equipment as required. Maintaining employee records and office files, handling complex scheduling a local policy and federal regulations. Responsible for training cashiers and shift lead, auditing registers, and keeping cashiers on task, as well as sales transactions and keeping a clean work environment, customer service, and housekeeping. Learning the ins and outs of the retail world and the ability to learn new things about the retail world. Objective : Accomplished sales management professional with 4+ years of experience as a Retail Sales Lead, successful in delivering sustainable revenue and profit gains in competitive markets. Self-starter and a quick learner, with extensive experience in customer service, sales, written and oral communication. Well-versed in leading group training and individual mentoring, realizing goals through informative demonstrations and engaging educational experiences. 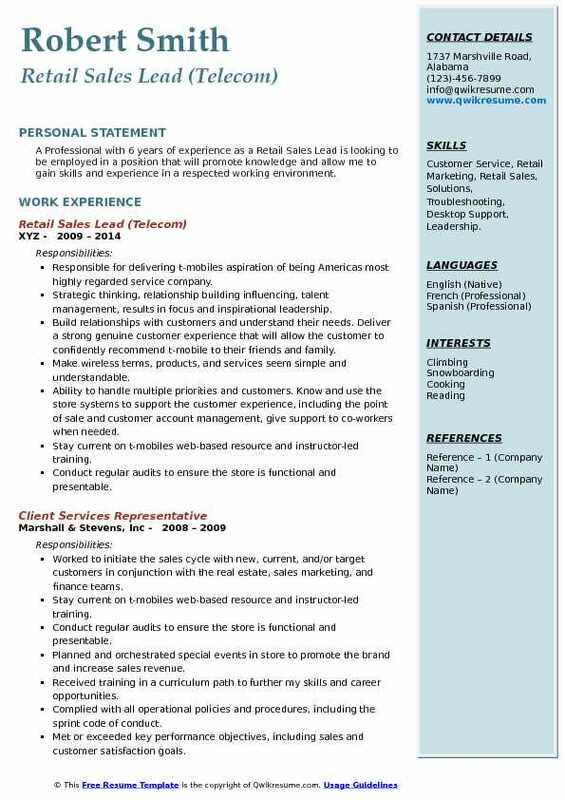 Skills : Customer Service And Sales Experience, Fluent In Spanish And English, MS Office, Data Entry, Editing, Video Editing, Social Media Marketing, Pivot Table, Troubleshooting. Promoting to sales lead after only three months because of excellent leadership qualities and consistently leading in all key performance indicators for sales. As a team leader, shares best practices for sales and customer service with other team members to help improve the store efficiency. Ensuring superior customer experience by addressing consumers concerns while demonstrating empathy and resolving problems on the spot. Demonstrating knowledge of all products, plans, and services, executing sales strategies both on the sales floor as well as through outbound marketing. Train customers on how to use new devices they may not be familiar with, as well as troubleshoot device issues. Maintaining store appearance and atmosphere, Right-fit customer for the optimal experience. Performing marketing duties by targeting potential geographic sales areas and working with third-party direct mail contractors to blanket mail in the identified regions. Protecting existing customers from fraud on their accounts by checking all ids on transactions and calling the account holder to confirm all new purchases.